What is First Past the Post System of Election in India ?? This is the system which is currently being deployed in the Lok Sabha elections and State Legislative Assembly elections to elect the members. This is a very simple method in which that candidate is declared winner who simply secures the majority chunk of votes in the elections. For example, Suppose in an election A,B,C,D secure 26%, 25%,25% and 24% of the votes. Then A will be declared as the winner as compared to all others A has scored the maximum number of votes. It is very simple and can be easily understood by the illiterate population of India. Before Independence, several elections have occurred on the basis of First Past the Post system so the Indian populace was very much familiar with this system. Also this system gives authority to an individual against the Proportional Representation system in which the authority lies with the political party. What is Proportional Representation System of Election ?? In this the election results are more representative in nature as the votes polled in minority are also counted to decide the final results. The single party dominance is difficult to achieve. Makes power sharing between parties and interest groups more visible. Facilitates minority parties access to representation depending on the magnitude of the votes garnered. 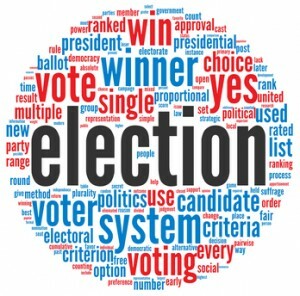 It combines the positive features of both First Past the Post and Proportional Representation system. In this two electoral systems using different formula are implemented simultaneously. In this the same voters vote and some seats are taken up on the basis of First Past the Post i.e. majority/plurality system and the other on the proportional representation system. When the results of the two elections are linked, with seat allocations at the PR level being dependent on what happens in the plurality/majority (or other) seats and compensating for any disproportionality that arises there.